Triund is the most popular trek around Mcleodganj. Nevertheless, this popularity comes at the cost. 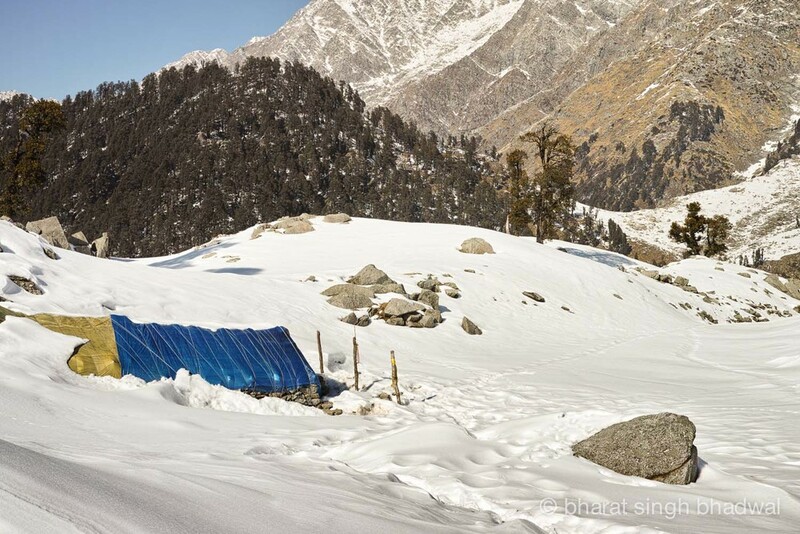 Permanent and semi permanent structures have mushroomed in Triund over the past few years and the tourist footfall has substantially increased. Therefore, if you ache for more solitude than Triund can offer or if you want to take an even closer look at the Dhauladhars, then Snowline café is the perfect place for you. I trekked to Snowline café a day after the Dhauladhars received a heavy snowfall. At Galu temple and at Triund the locals warned me that the café was closed and that the route would be difficult owing to the heavy snow and ice. The locals were right. In places, the snow had turned to ice and a sheer fall to our right was not reassuring. However, all this was soon forgotten when I caught my first glimpse of the beautiful view from the Snowline café. At Triund, the Dhauladhars tower majestically over you, but at Snowline café they are within a touching distance. Dhauladhars - up close and personal. That night was one of the coldest and the windiest that I have experienced in this area. My thermometer recorded a temperature of -9 degrees C, and this was without the windchill. I was quite thankful when the sun came up at seven the next day and the wind dropped. After a tepid cup of coffee, I spent the next few hours photographing the panoramic vista around Snowline café. At 11 AM I started my walk back to Triund and I was back at Galu Temple in under three hours. Follow the trail north past the shrine and the rest houses at Triund. Yellow arrow marks on boulders mark the trail to the café. But these arrow marks may be a bit difficult to spot over fresh snow. However, the route is the only natural trail and it is well used by people and mules. Therefore, navigation is not a problem. After the rest houses, once a small shrine with Tibetan prayer flags is visible the trail turns right and hugs the hill, on just keeping below Triund hill. Triund Hill with Kunal Pathri temple on top is visible to your left. A first few curves along the hill usually receive a lot of snow and can be quite tricky because of the steep fall to your right. The trail is rocky and steps cut in rock till the Jhande Wali Mata temple. This small shrine along the route is the first waypoint on this trail. From Jhande Wali Mata, the trail meanders along a few switchbacks, gaining altitude till you reach a ridge that links the Triund hill to the Illaqua meadow. The snow is usually the heaviest along this ridge. On our trek we experienced over a foot of snow at this point. From the ridge it is a straight walk and a gentle descent to the Snowline café. You can rent bedding and stay at Snowline Cafe if it is open. The tea shops en-route to Triund will tell you if thats the case. The stay options in Triund have increased over time. The oldest structure is still a forest guest house which can be booked at Dharamshala. The booking office lies behind Park Restaurant opposite to Dharamsala Police Station and General Post Office. Another guest house with two rooms run by a tea shop owner. A room at either of these guest houses costs Rs. 500 / night. Caution: Attempt this trek if you have the required winter trekking experience. The trail is narrow and snow covered with a dangerous potential for a fatal fall. There is no water en-route. Buy and carry water from Triund.